All the Peninsulas on the Kerry coast line are well worth a full day out or two if you can afford the time. One of the best things to do or see at least once from this peninsula is to go and experience the Skelling Rocks. Killorglin or Portmagee are ideal places to stay the night before. Killorglin is a short drive and offers the visitor a lively atmosphere a choice of restaurants. This charming market town has a rich history and is famous for Puck Fair, a popular festivals that draws crowds from all over the world, it usually runs the first or second weekend of August annually. This is an ideal day as I said before if one starts in Killorglin or Portmagee. It needs to be mentioned here that if one wants to camp and there is weather for it, St Finians’s Bay, south of Portmagee (ask a local) is perfect. It is nestled after the windy hill on the ring going south and is a perfect place to wake up after a night under the star drenched sky as this part of Kerry has very light pollution. Apologies for that short detour! Words cannot express how awe inspiring a trip to Skellig Michael is and it is equally breath-taking on the first or tenth time. No movie or review can do this magical island justice! 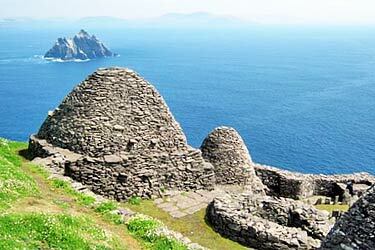 There is a boat service to Skellig Michael that runs between the months of April through September. This trip requires advanced booking and is well worth it. There are different times for boats running but an early morning booking is good as this journey takes around four hours pier to pier. Eat something substantial the morning of your trip to Skellig and bring a packed lunch and a drink. As the Islands are just over 11Km off coast the temperature is much cooler than on the main land. Bring these recommended items on any month you are visiting: a hat, an extra fleece jumper and a wind proof jacket are recommended, trust me these items are not over the top even in the month of July! Good footwear is essential. Most importantly bring a good camera as there are so many photo opportunities on every leg of the journey. Firstly, visitors are taken out by small transformed fishing vessels, there is nothing fancy about these boats. People are often turned off by the diesel engines but they are needed for their power out in the Atlantic. If you do happen on some swell it can be fun and frightening but these are experienced fishermen and will not attempt the journey if the sea is not safe! The climb sounds worse it is. It takes roughly 40 minutes to ascend to the top. A relative degree of fitness is required but if you suffer from vertigo this is not the activity for you. One piece of advice: don’t look around trying to get up or down the steps. Stop if you have to and look around and enjoy it knowing you are safe and keeping other safe. Visitors are allowed around 30 minutes at the top to relax. It really is an amazing place to sit and ponder the meaning of life. As stated before it is awe inspiring. If the day is somewhat clear the coastline is surreal, strangely far in the distance; the sense of perspective is really amplified by thinking that one is so small sitting out on a rock in the Atlantic ocean, so exposed! This barren island is fairly breezy, even on a fine day. The boats go straight out to Skellig but on the way back they swing by the smaller islands that are populated mostly by the magnificent puffins. The boats engines are shut down and the feeling of being out at sea with these fascinating creatures is really amazing. You are so close you can smell and hear the flow and ebb of their very being. As one pulls away from The Skelligs and the slightly wilder waves of the Atlantic proper one starts to feel safer that terra firma is approaching, leaving the magnitude and uncertainty of the Atlantic ocean behind. After that experience it is hard to top that in the same day but one can try on the Iveragh Peninsula. Valentia Island is accessible by bridge nearby and this island is worth exploring for two reasons: the lunar landscape and beautiful walks offered by the western part of the island and the quarry on the northern side of the Peninsula. The grotto and slate quarry was opened in the early part of the 19th Century. It was closed for a number of years due to a rock fall in 1910. It reopened and is run on smaller scale today. The stone from this quarry was mostly exported by the Knight of Kerry and sent all over the world helping roof and floor spaces such as the Houses of Parliament in London and the Paris Opera House. What makes this quarry so bizarre it the statue of the Virgin Mary placed at the top of the entry way in 1954 the Marian year across Ireland, now this statue is celebrated through out the year, many celebrations and masses take place here in the sheltered entryway to the mine. A short distance from this on the road out there is a fabulous opportunity to get photographs of the Dingle Peninsula, just north of Valentia. We will now get back on the road and head south for approximately 40 minutes driving along the coast line to Waterville. This town has a touristy feel about it but it has some beautiful old fashioned and new hotels right on the water. This town would have been popular with visitors who started coming to Ireland, more regularly with the opening of railway systems in the late industrial era, around 1860. You could be tempted to eat a bite in Waterville, but don’t! Keep on the road south for a few miles and there is restaurant on top of a bendy hill called Scare Coeur, just outside of Sneem. If you are not hungry and it is a fine day for a walk or a swim the beach at Castlecove is one of the finest on Ireland’s west coast and sheltered from wind somewhat, like Ballybunion (north Kerry) by gentle rolling cliffs. The final leg of our day trip takes us to Staigue Fort just three miles beyond Sneem on the road to Kenmare, N70. From the main road there is a bit of a trek to get up to the hill to visit this very good example of a ringfort from the Ironage. This fort was built with vaulting detailing and no mortar or dressed stones. This interesting structure is fun to walk on and around and boasts beautiful views, of Kenmare Bay. Most people are very frustrated by the time the reach this fort but are so glad they experienced this structure afterwards. It is world away from the Skelligs and the sea earlier that day!